Original German made BMW OPS scanner set (Retail Price: $4,000). We are the only authorized distributor online that sell German made scanners. You can't get our prices anywhere for this item unless you are purchasing significantly lesser quality, non-German auto diagnostic scanners and software. We order in bulk and this is why we can offer our customers lower prices for German made scanners. The non-German units are made from cheaper material so it will burn out internally in a few months and once you plug in these scanners they will bring up unrelated codes in the vehicle. By going with the cheaper quality scanners you win on a lower initial price-point but most often the investment is doubled or even tripled when you need to purchase a whole new scanner due to no available software updates, technical support and replacement parts. We have been in business for 11+ years, provide warranty, future software updates and free technical support for the life of our scanners. We are very confident in the scanners we provide that we offer a 30 day risk free trial period. Our scanners are very user-friendly and are plug and play so when you get the unit(s) you just simply connect to your vehicle and start working. Please see our feedback from customers that have purchased our units as we always have 100% satisfied customers after they have used our units. Think about your purchase before you make a decision. Remember: "Quality and service are remembered long after the price is forgotten”. ONE SET (LAPTOP INCLUDED IBM T60). Software is preloaded plug and play. This scanner is a brand new 2014 model directly from the manufacturer made in Germany. It is the first time for BMW to use fibre-optic cables as the standard for communication between control units on vehicle models from the E65 and on. The optical buses are notable for their high data transmission rate and they are not susceptible to electromagnetic interference. The optical buses in question are the MOST bus, primarily used for in-car entertainment electronics, and the byteflight bus, which serves predominantly safety-critical functions. OPPS has been designed for encoding, individualizing and programming ( CIP) via the Software Service Station (SSS) and envisaged for use as part of the BMW diagnosis Information system (DIS) from DISPlus and Group Test One (GT1). It is intended for testing and programming tasks from the E65 series, taking the place of the diagnostic head. OPS is intended for rapid programming of control units. When operated at the SSS, no diagnostic or technical measuring procedures are possible, as no measuring technology is incorporated; in this instance, OPPS / OPS is used predominantly for programming control units (flashing). Communication with the vehicle can be performed both via the MOST and via the OBD interface. The OBD interface is required for the power supply to the OPPS / OPS and has communication properties via which the vehicle can be identified and the data to be programmed can be determined. From CIP version 7.0, it is possible to delete fault code memories via OPPS / OPS. 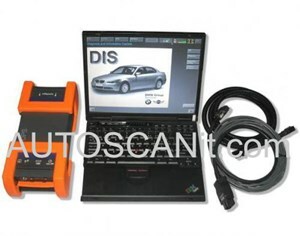 DIS V57 is the main software for all BMW and MINI series diagnosis. It makes a complete Diagnosis. If it finds error codes you can erase them or continue with each error code to see what produces it and how to fix the problem. Inside DIS you will find TIS too. TIS (Technical Information System for BMW) is the main software for complete diagrams of BMW vehicles and how to repair them. As usual DIS and Progman are for IBM T30 laptops but this is installed in fast IBM T60 laptop With this Software that is already installed you don)t have to buy an old and slowly IBM T30 laptop, Its preinstalled in IMB T60 laptop ready for use, just plug wires and work. Have been looking for mths for this...excellant service and price!!!!!!! Got what it was described and recommend Autoscanit to my friend and he purchased as well, same thing very good original scanners.